How Many Calories Are In A Slice of Pizza? An average slice of delivery chain cheese pizza has about 249 calories. But the calories vary greatly by brand, toppings, and crust style. Use the charts below to see the calories from the most popular pizza delivery chains and frozen pizza brands. You can cut the calories in a slice of pizza by over 20% if you chose thin crust instead of regular crust pizza. But be careful of the toppings you choose. Loading up your pizza can increase the calorie count by over 75%. You’ll find a huge range of calories in pizza from vary delivery chains. The calories depend not only on the chain, but also on the toppings and style. An average slice of thin crust cheese pizza is about 217 calories, while an average slice of regular cheese pizza is about 278 calories — that’s 28 percent more calories. So thin crust is usually your best bet if you are counting calories. What if you add pepperoni? An average slice of thin crust pepperoni pizza has 258 calories. Regular crust pepperoni pizza has 311 calories (12 percent more). Want more toppings? Choose carefully. 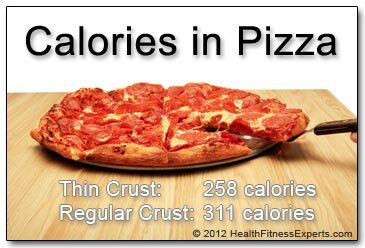 For example, one slice of Domino’s ExtravaganZZa Feast pizza (368 calories) has 75 percent more calories than Domino’s Crunchy Thin Crust Cheese pizza (209 calories). The charts below show calories and nutrition facts for popular pizza variations from Domino’s, Little Caesars, Papa John’s, Pizza Hut, and typical pizza parlor. Calories shown are for 1 slice of pizza. A whole pizza is typically 8 slices. Source: USDA National Nutrient Database. See References and Sources. Just like pies from pizza delivery chains, frozen pizza calories vary greatly. For example, one slice of DiGiorno cheese rising crust frozen pizza (468 calories) has over 75 percent more calories than a slice of Kashi Mediterranean frozen pizza (277 calories). The chart below lists the calories and nutrition facts for the popular DiGiorno and Kashi frozen pizza brands, plus generic “typical” frozen pizza. But luckily, packaged frozen pizza always contains a Nutrition Facts label, so you can easily check any frozen pizza yourself before you buy it. Read the Nutrition Facts labels and make a healthy choice! Are you making your own pizza and wondering about calories in jarred pizza sauce? Or are you about to grill a pizza burger patty? You can check the chart below to find the calorie count. But just like pre-packaged frozen pizzas, these prepared foods should have Nutrition Facts labels on the packaging. So read the labels to find out the calories and other nutrition information for the specific products you are buying. You can see that pizza can have a wide range of calories — from relatively low to quite high. On average you’ll save about 28 percent of the calories if you choose thin crust pizza over regular crust. If you add toppings, try to stick with vegetables, which will add healthy nutrients while keeping the calorie count low. But fried vegetables — like fried eggplant — don’t count. They’ll increase the calorie count quickly! You can use the charts above as a guideline to make wise choices about both the pizza you choose to eat and the pizza you should choose to avoid. But no matter what pizza you are eating, remember that the quantity is important. Eating four slices of most any pizza will add a large chunk to your daily calorie count — and likely your waistline, too! What’s your favorite (hopefully healthy) pizza? Do you have any advice for making healthy choices when eating pizza? Is there any pizza that you avoid? Leave a comment below and share it. One way to lower the calories and reduce the fat is to limit the meat and load up on the vegetables.